Commuting can be such a tedious, frustrating affair, exacerbating every minor inconvenience into a mounting tension—one that’s only compounded by the dehumanizing isolation of our cars. But as road rage incidents continue to rise, accelerated by a nation that’s never seemed more fractiously divided, some hero drivers are doing their part by ordering “COVFEFE” vanity license plates, thus bringing the healing, bipartisan gift of topical mirth to the nation’s highways and byways. Now no matter where you’re headed, all roads lead in one direction: laughter! According to CNN, motorists in at least 21 states have now claimed license plates memorializing the misspelled tweet recently dispatched by Donald Trump amid another string of invective launched at the media through his official Twitter feed, excoriating it for reporting on the ongoing investigation into a possible collusion between the Russian government and a sitting U.S. president. In his haste to discredit the free press, and to denounce it as an enemy of the state for daring to not kowtow to his absolute authority and to question his basic capacity for the job by reporting on the many contradictions, crises of diplomacy, and outright lies his administration has already produced in such an astoundingly short span, Trump accidentally typed “covfefe,” bungling even this key-mashing that now stands in for statements from the highest office in the land made by the impulsive, pettily vindictive man who holds it. And now it’s a hilarious license plate! CNN reports that Nebraska’s Evan Milton, 26, was one of the first to acquire “COVFEFE” in his state, learning of the funny word’s existence at approximately 4 a.m., then racing to the Nebraska Department of Motor Vehicles website to purchase it and thus become immortal—a dream he’s harbored for a while now, Milton says, in his quest to own a meme-related license plate. “I count the letters of every garbage meme that comes through,” Milton told the Lincoln Journal Star of this proudly American pursuit of happiness. “This whole thing is so ridiculous.” Indeed! And it now belongs to the ages—and to you, weary traveler! In California, Craig Cooper, attorney at law (and laffs! ), briefly became a viral star himself when his daughter shared his own, presciently acquired “COVFEFE” plate with Twitter, his photo garnering nearly 100,000 likes and more than 20,000 retweets. Sadly, despite his own Twitter popularity, you can’t put Craig Cooper’s face on a license plate. The DMV still requires it to be a combination of numbers and letters, in addition to humorously capturing the zeitgeist. Strangely, although CNN reports that Cooper “still thinks it’s funny, now that the initial excitement has worn off… he hasn’t decided whether he will put the plate on his car when it arrives.” So it’s possible Cooper plans to withhold his “COVFEFE” plate from the world, denying his fellow Californians the unifying, purifying relief of laughter that can only come from seeing the nonsensical garbage word banged out rashly in a fit of early morning pique by the man who’s charged with our future as he hunched on the toilet, grimacing over Drudge Report, here emblazoned across the car idling next to them as they both crawl through traffic, heedlessly belching carbon monoxide into air whose concerns are no longer ours unless it wants to start buying coal. Don’t do it, Craig Cooper! Give us the “COVFEFE,” so we can laugh about it with our last, smog-choked gasps! Fortunately, road warriors in other states have not been as selfish, meaning you’ll soon be seeing “COVFEFE” all across this great land of ours, and be constantly, uproariously reminded of this hysterical little grammatical whoopsy-doodle made by a reckless authoritarian while you hurtle uncertainly toward your own darkened horizon. 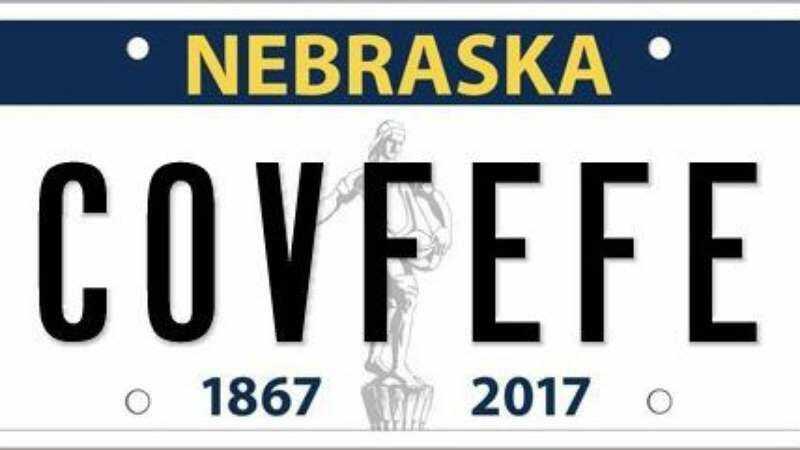 And if you want to get your own “COVFEFE” license plate, you’d better hurry! Only New Hampshire, North Dakota, Pennsylvania, South Dakota, Washington, West Virginia, and Wisconsin still have it available and we could all be dead soon.